Labour research and development staffs with TURC. Hi! 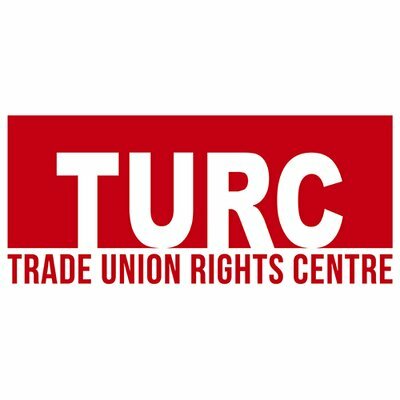 We are TURC, Trade Union Rights Centre, a labour NGO based in Jakarta. We work in the various locations through Indonesia, South Asia, and South East Asia with palm oil labour, home-based labour, and manufacturing labour, aiming to promote decent work and empower working class with providing labour rights education, labour legal assistance, and labour studies. Currently, we need research and development staffs to support TURC in doing labour-related research, policy research, and internal knowledge management. If you passionate about Indonesian working class and other related to it namely gender equality in the world of work, informal economy, labour normative rights, industrialization, social security, social movement, and many others, this opportunity definitely will be a perfect match for you. We encourage all passionate persons who have a serious guts and willingness to struggle with and be part of labour movement to give us a hint with sending your resume to andy.akbar@turc.or.id and info@turc.or.id before 10 April 2019, 23.00 GMT+7.